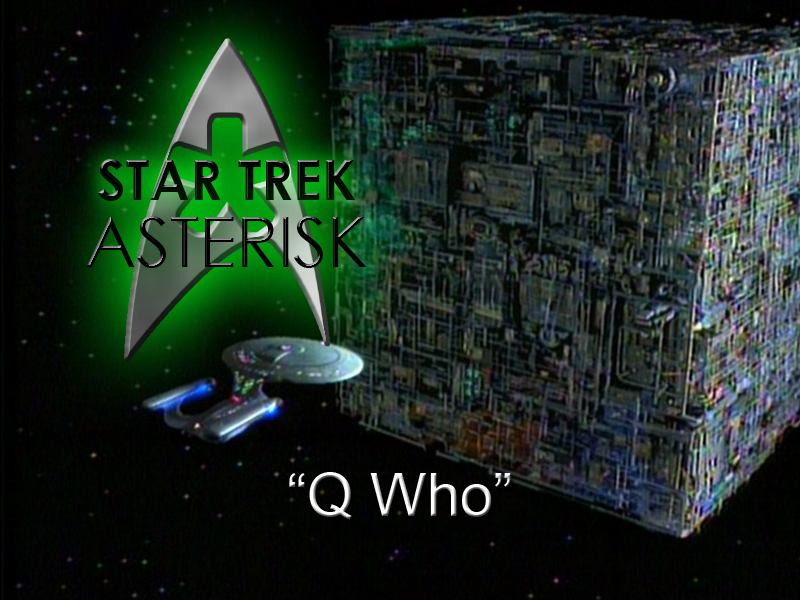 Star Trek: Asterisk "Q Who"
Q returns and insists there are things for which humanity is not prepared. For example, space zombies. The episode opens with a new officer, Ensign Sonya Gomez, getting a cup of hot chocolate from the replicator. Then after talking to Geordi in engineering for a while, saying how nervous she is and basically establishing herself as the comic relief, she spills that cup of hot chocolate all over Captain Picard who happened to come around to Engineering for... some reason. Doesn't matter what reason, though, because just as quickly as he arrived, he leaves to change his shirt. Only, when he steps out of the turbolift... he finds himself in a shuttle. He's confused for about thirty seconds until the pilot of the shuttle turns around and reveals himself to be Q.
Picard objects saying that Q promised to leave his ship alone, but Q counters saying that they are, in fact, nowhere near his ship. The Enterprise is lightyears away from their position in the shuttle. And then Picard refuses to engage Q in conversation. Which is really not a good idea since he's pretty much the only way he's getting back to the Enterprise. Meanwhile, back on the Enterprise, Guinan is having one of her moments. She calls to the bridge and asks if anything strange is happening because she feels... off. 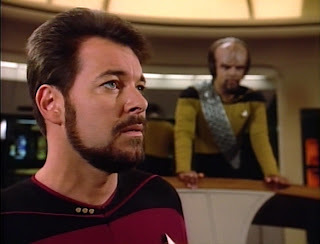 Riker insists nothing is wrong, but eventually they realize that a shuttle is missing from the shuttle bay and that Picard is not on the ship. So I guess something was wrong. 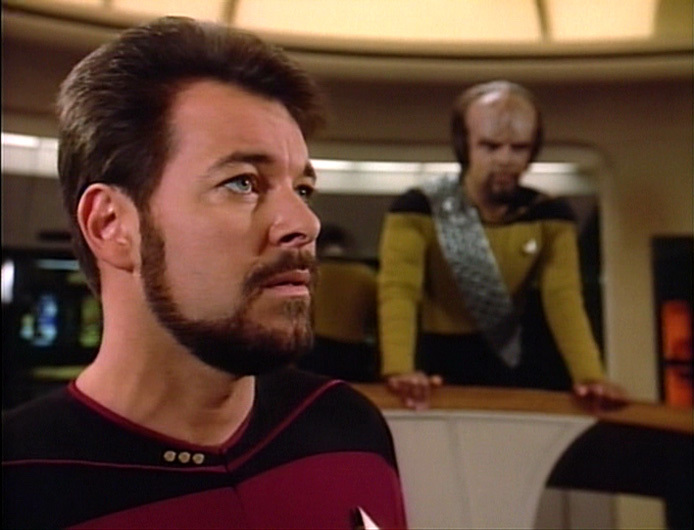 Meanwhile, Riker wonders if he left the oven on. It doesn't take long for Picard to give into Q's insistence that they have a conversation, but only if he takes them back to the Enterprise. So Q takes them to 10-Forward where they meet Guinan and she and Q have a little bit of a showdown. Because, obviously, they've met. Q eventually reveals that he wants to be a part of the crew. After laughing for an hour, Picard asks why and Q says he was kicked out of the continuum and has been bored ever since. And, besides, there are things out here for which they are not prepared; for which they need the help of a Q. Picard says "Yeah, right, okay, no, you're not part of the crew." So Q says, "alright, I'll prove it to you." And with a snap of his fingers, the Enterprise is flung into Borg territory. Turns out Guinan knows about the Borg, too, so she tells them all she can about them. She wasn't on her homeworld when they attacked, but she knows that they left nothing. All they want is to consume technology. And that's what the Enterprise is. A Borg cube comes into view and it doesn't take long for a drone to transport into Engineering and take a look around. Picard has Worf shoot at it and it takes some great power to take it down, but once it's down, another takes its place. When Worf shoots the next one, it's discovered to have shields. It's adapted. After the drones take what they wanted, they leave as suddenly as they came. Picard holds a meeting with senior officers and Guinan during which Q shows up and says basically "See? Don't you want me on your crew now?" 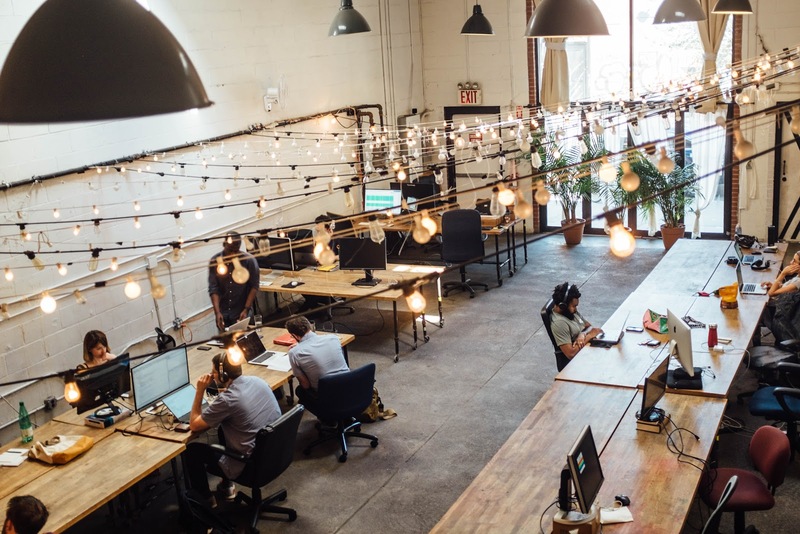 It would probably have been a good idea to say yes, because that's when the cube holds down the Enterprise and slices it up like a Thanksgiving turkey. It takes a sample of the saucer section and, in the process, kills 18 crew members. So the Enterprise shoots at it and succeeds in breaking the tractor beam. While the Borg ship recovers, Riker, Worf and Data beam over to it to see what it's made of. All the Borg are still alive, but in stasis. They seem to ignore them while they walk around. 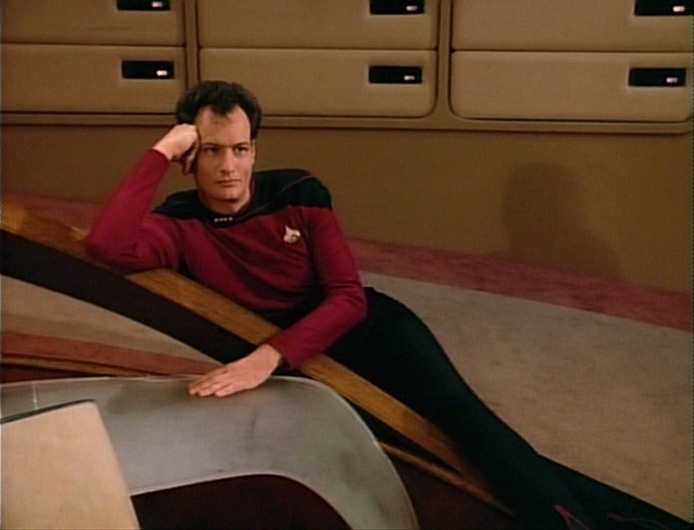 And then Data discovers that the ship is regenerating. They're in trouble. They immediately beam back to the Enterprise and warp away, but the healing cube follows them and matches their pace. 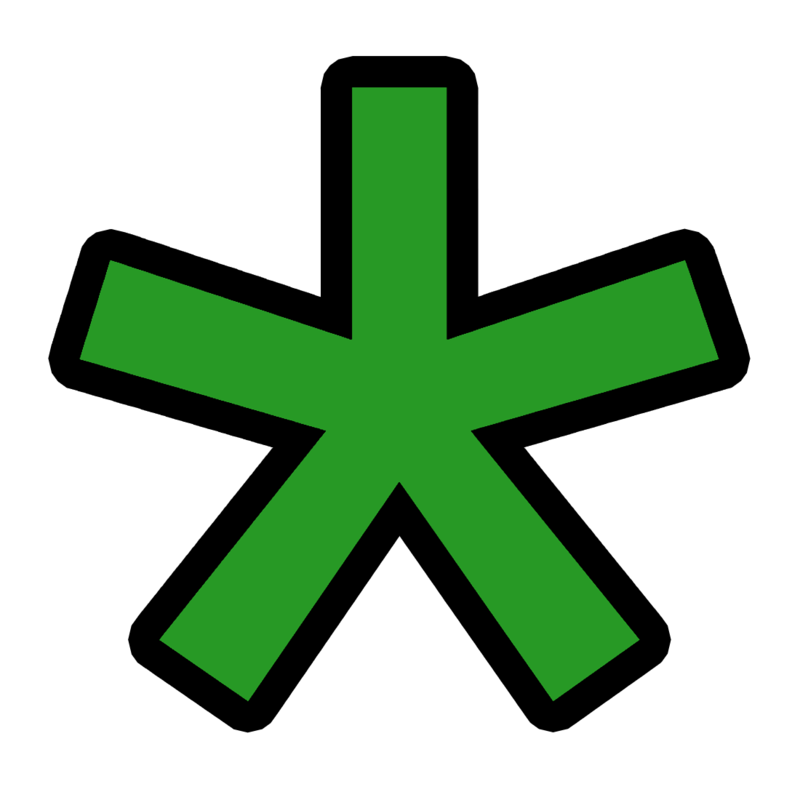 The cube fires a weapon that drains the Enterprise's shields. Then it fires a weapon that drains the Enterprise's engines. The Enterprise is a sitting duck. And then Q shows up one last time. He taunts Picard saying that he can't outrun them or or destroy them. 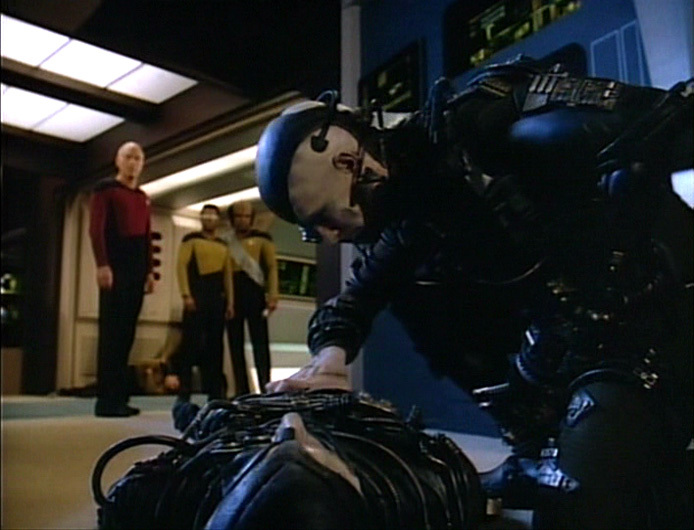 Picard has had enough and basically admits that, okay, fine, they're not ready for the Borg. With that admission, Q snaps them back into Federation space and congratulates Picard on being so humble. Another man would have died. And then, apparently forgetting about his insistence on being a part of the crew, Q leaves. Because all Q is good for is telling us how puny we are. On their way to the nearest starbase, Picard talks to Guinan in her office about the encounter. Guinan says that, at the moment, the Borg only see the Federation as raw material that they can consume. Picard says that they will be coming, but then he gives Q a little credit. 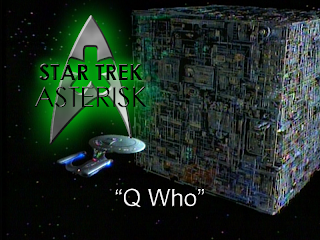 Without Q introducing them to the Borg, they may not have been ready for the Borg introducing themselves. Let's be honest, as a stand-alone episode, this wasn't that great. It was, however, wonderful as a setup episode. The original intention was for this episode to be connected with the episode "The Neutral Zone" in which starbases were mysteriously being destroyed. There was a passing reference to that in this episode, but no one really put it together that the starbases were, in fact, destroyed by Borg. The Next Generation features Star Trek's first foray into episode arcs, as I've said many times, and this represents a great part of an arc.